In fixing up after my computer meltdown (yes, I keep talking about that – event of the year) I bought Asus P5Q-EM motherboard. It is positioned as home theater and energy efficient model so I was curious to see how good it would be for silent computing. ensure that computer goes into power saving mode when not used. Since these are applied at the different times they are naturally both used and Asus provides software lineup to handle both tasks. This one is supposed to be central hub to power saving features but except being installed there is no actual need to run it. 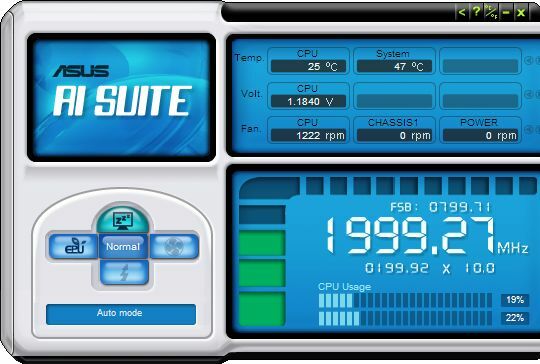 Ai Suite interface only provides shortcuts to other utilities and displays information about current computer condition. In really bulky way. Out of four utilities overclocking and fan control are incompatible with power saving mode so I am skipping them. Utility controls processor, video card, hard drive and fan (four items). EPU-6 engine that comes with some other Asus motherboards adds chipset and memory. Auto is switching between two other, according to current CPU load. It all seems very cute and useful. Unfortunately with my knowledge it took little time to understand that this is closer to smoke screen. CPU control is actually Enhanced Intel SpeedStep technology. It is good one but has little to do with Asus and Windows XP SP2 (and newer) make use of it natively (with proper settings). Actually I noticed that at times Windows simply overrides whatever EPU engine is trying to do with CPU. video card control requires one of the EPU-4 compatible external cards. And since I use X4500HD video, integrated in motherboard chipset – EPU does absolutely nothing. HDD control is limited to shutting down drives not used for some time, duplicate of native Windows function as well. fan control is potentially useful but my mid-spec Pentium E5300 it does not get hot enough for high RPM and on low end utility is incapable of stopping fan completely – it always spins. For my setup EPU Engine is frankly redundant. It either copies native Windows power saving functions or aims at PC with high specs so it has something to reduce. Sending computer into sleep or hibernate mode means it stops all operation. Ai Nap is special mode that claims to enter power consuming state while keeping computer completely operational in background. In practice it disables video output, sending monitor to standby. I can only assume rest is comparable (or equal) to running in power saving EPU engine mode. There is also additional prompt that asks if you really want to wake computer up. Annoying issue is that Ai Nap hijacks hardware power button. Instead of starting shutdown routine it sends computer into Ai Nap. Took me plenty of failed attempts to re-learn using Start menu instead of simply tapping button on case to turn computer off. Asus set of utilities puts up a nice front but doesn’t perform many unique functions. For experienced user and mid-spec computer this would be simple wasting resources on something Windows does anyway. Novice users may find using Asus utilities easier than tweaking OS. 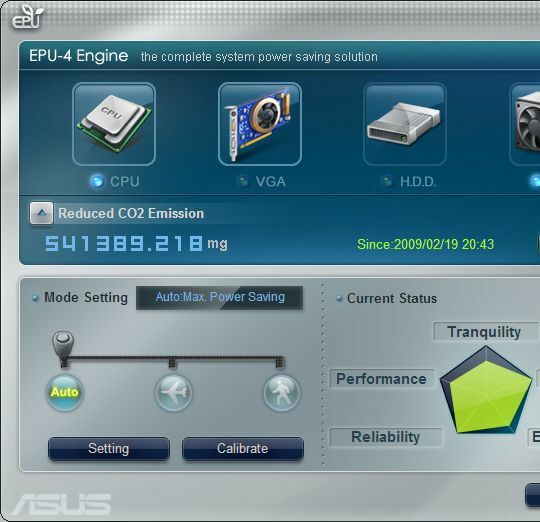 As for energy saving and silence benefit Asus utilities will only shine on high-spec gaming machines. Users of which hardly care about those issues anyway. Anyway aside from software Asus P5Q-EM is actually good choice for silent computer with passive chipset cooling and relatively powerful integrated video. As long as you skip native software and spend some time learning up on Windows tweaks and using SpeedFan. Are you prepared for computer meltdown? Since I can’t see how old this post is… I’ll just let you know that AI Nap is a pretty nice feature. It powers down the graphics and audio cards, puts the cpu and fans into a lower power state but keeps the network and hard drives active- great for uses like servers, long downloads, and quick remote access. All specialized functions, yes, but a great idea that I wish had more widespread support. As per post I didn’t like AI Nap. I doubt that integrated (in my case) video and audio made much difference and I clearly remember it didn’t make fans quieter. My current build is Mini-ITX with Zotac motherboard so I don’t know how well current versions of Asus software work.